I was so pleased to receive several new cookbooks for Christmas, including a long wished for copy of Julia Child’s Mastering the Art of French Cooking. I’m enjoying reading that book and planning just what I want to tackle from its huge volume of recipes. But the cookbook I’m really enjoying the most is one called The Complete Irish Pub Cookbook. It has completely captivated me with its fantastic recipes and incredibly beautiful photography of the Irish countryside. I’ve read all the way through it three times already. I want to start at the front cover and make every single recipe in it. And I think I just might do that. 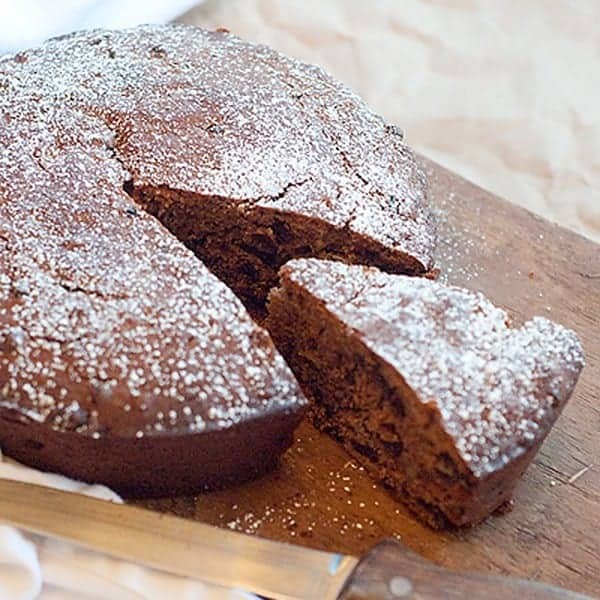 The very first recipe I chose to try from this lovely cookbook is this Irish Spiced Fruitcake. We love our traditional holiday fruitcakes but I know that many people don’t care for the candied fruit in those. If you’re one of them, you really should try this cake instead. No candied fruit in sight. Just lovely dried cherries, raisins and currants. And the spices are heavenly. A lovely combination of allspice and ginger give just the right flavor along with the dried fruit. I did a little research on this cake since I’d never seen a method quite like this one. What I found was that this traditional recipe is also called an “Irish Boiled Fruitcake.” You’ll see why that makes perfect sense when you read the recipe which, by the way, is ridiculously easy. I also found that this is typically served for an afternoon snack or tea. Before you start, prepare a deep 8″ cake pan or 8″ square pan by greasing it with butter. Cut a piece of wax paper to fit the bottom of the pan. Place the wax paper in the bottom of the pan and then grease the wax paper as well. Set that aside. Next measure all your ingredients except the flour and eggs into a saucepan. Bring that to a boil while stirring constantly. Lower the temperature and let it simmer for 5 more minutes giving it a stir every once in a while. Remove the boiled mixture from the heat and let it sit for about 30 minutes or until it has cooled. It will thicken a little while it cools. While the boiled mixture cools, preheat the oven to 350 degrees. When the mixture has cooled, stir in the flour and eggs. Stir thoroughly to make sure all the flour is incorporated into the mixture. Pour the batter into the prepared pan. Cook for 30 minutes. Reduce the heat to 325 and continue cooking until a tester inserted in the center of the cake comes out clean. A note about the cooking time: The original recipe (along with others I’ve seen on the internet) says to cook at 350 for 30 minutes, reduce the heat to 325 and continue cooking for 1 hour or until a tester inserted in the center comes out clean. I’ve made this cake twice and both times my cake was done after the first 30 minutes. I can’t imagine how burned it would be if I continued to cook for another hour! However, I realize that baking times vary from oven to oven and also based on the material of the pan you’re using. My recommendation is to check the cake after 30 minutes and if it’s not done, reduce the heat to 325 and continue to cook checking every 10 to 15 minutes. When the cake is done, remove it from the oven and let it cool in the pan for 10 minutes. Turn it out onto a cooling rack and cool completely. Dust with powdered sugar if desired. I served this cake with black cherry yogurt alongside. It was a delicious combination. A traditional Irish recipe. Makes a wonderful dessert or afternoon treat. Especially nice served with black cherry yogurt on the side. Put all ingredients except flour and eggs into a large saucepan. Bring to a boil over medium high heat while stirring continuously. Reduce heat and simmer for 5 minutes stirring frequently. Remove the pan from the heat and allow to cool for about 30 minutes. Preheat the oven to 350 degrees. Grease a deep 8” cake pan with butter. Line the pan with wax paper and grease the wax paper as well. Stir the flour and eggs into the cooled fruit, spice, and nut mixture. Make sure the ingredients are well combined and no dry flour is visible in the mixture. Bake for 30 minutes at 350 degrees. Test the cake by inserting a skewer or toothpick in the center. If the tester does not come out clean, lower the oven temperature to 325 and continue baking until and testing every 10 minutes. The additional baking time will vary greatly depending on your oven and the cake pan used. Watch carefully as the cake can burn easily. Cool cake in pan for 10 minutes. Invert onto a wire rack to cool completely. Dust with powdered sugar if desired. The cake will keep for several days stored in an airtight container. Tara – I’m definitely going to have to make this again with the dark beer. Thank you so much for sharing that hint! I absolutely love cakes like this and cannot wait to try this one.. reminds me of one my Grandma made when I was a little girl – we’d have a small slice with our “tea” in the afternoon! Pub food, if done well, is amazingly good!! I know what you mean about the scenery – when we were there it was a good thing my husband was driving otherwise we’d of ended up in a ditch due to my “rubbernecking”!! I love these kinds of cakes, too, Nancy. I’ve never been good at layer cakes with all that frosting and filling. I do them once in a while, but much prefer a simple one-layer cake of this type. I know what you mean about the scenery! When we were there, I couldn’t watch the road for looking around at the absolute beauty everywhere. My heart still longs to take another trip to Ireland. I will let you in on a secret ….. don’t tell anyone else….. if I have to make a cake, you can be pretty safe in betting that it will NOT have icing that has to be cooked like a candy process. Not that I cannot do it, but I choose not to do it. Yep, most of my icing will be of the cream cheese/powdered sugar variety. Therefore, this looks wonderful. No icing required. Yes, me and layer cakes just don’t really get along. I can do them if I *have* to, but I never enjoy making one. Cream cheese and powdered sugar…that’s the way to go! I’ve never made a fruitcake, but this makes me want to try! Give it a try, Sues. I think you would like it. I love the no-fuss prep method for this cake and the fact that it doesn’t need any frosting – looks easy and delicious! I was amazed at how easy this cake was to make. And the result is just delicious! Hope you give it a try. I am definitely one of the many people who do not like traditional fruitcake. This cakes sounds very tasty. We like them both, Wendy. I always make a traditional light fruit cake for Christmas, but this one is great for any time of year. It’s especially good with a nice cup of coffee on a cool afternoon. Sounds lovely for a winter’s afternoon tea-time. Thank you, Lucy. It’s a delicious recipe and goes well with a cup of Earl Grey or Irish Breakfast tea. I pulled down my Irish Pub Cook Book to look for a shrimp spread and happened upon the fruit cake recipe. It looks so inviting and I happen to have fruit ready for a Traditional English Fruit Cake that I did not make. (I usually make them by the 1/2 dozen). I glanced at the recipe and just re-read it and saw the unusual step of boiling all together(except the flour and eggs). I thought to see what other recipes for the same type of cake asked for and behold…here I am on your site! I can’t wait to make this cake and use up the fruit that was meant for another! Can regular granulated sugar and brown sugar be used in place of turbinado or raw sugar? I have never used those before and hate to buy them just for one recipe. Pretty pricey. You could try light brown sugar as a substitute, Sylvia. However, I have not tried it myself so I can’t guarantee your results, but I’d think it would work.